London: Pluto Press Limited, 1985. 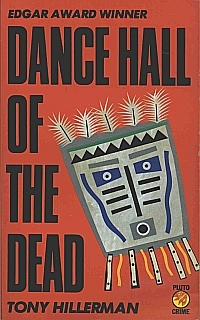 The first UK hardback edition of Dance Hall of the Dead was issued in both hardback and paperback editions. The dust jacket of the hardback edition is replicated exactly in the paperback edition. Both note that the novel won an Edgar Award. Not mentioned on the cover is that the prize was awarded in 1974. It is also emblazoned with an artist's rendition of a fictional kachina mask. Format: Hardback, 18.5 x 11.5 cm. Binding: Cloth covered boards with imprint along spine. Striking red cover with full color kachina mask graphic.